Pavel Alexandrovich Florensky (also P. A. Florenskiĭ, Florenskii, Florenskij, Russian: Па́вел Алекса́ндрович Флоре́нский) (January 22 [O.S. January 9] 1882 – December 1937) was a Russian Orthodox theologian, priest, philosopher, mathematician, physicist, electrical engineer, inventor and Neomartyr. Florensky, Pavel (2004). The Pillar and Ground of the Truth: An Essay in Orthodox Theodicy in Twelve Letters. Florensky, Pavel (1999-02-13). Salt of the Earth (The Acquisition of the Holy Spirit in Russia Series, Vol. 2). Saint Herman Press. Florensky, Pavel (2006-08-15). Beyond Vision: Essays on the Perception of Art. Titova, Irina (2002-10-01). Russian da Vinci' May Be Among Remains"'". Leach, Joseph H. J. (Fall 2006). "Parallel Visions - A consideration of the work of Pavel Florensky and Pierre Teilhard de Chardin". Theandros 4 (1). Retrieved 2007-09-04. Rhodes, Michael C. (Spring 2005). "Logical Proof of Antinomy: A Trinitarian Interpretation of the Law of Identity". Theandros 2 (3). Retrieved 2007-09-04. Steineger IV, Joseph E. (Spring–Summer 2006). "Cult, Rite, and the Tragic: Appropriating Nietzsche's Dionysian with Florenskii's Titanic". Theandros 3 (3). Retrieved 2007-09-04. Bird, Robert. "The Geology of Memory: Pavel Florensky’s Hermeneutic Theology". equestrial.ru. Retrieved 2007-09-04. Reardon, Patrick Henry (1998-09-01). "Truth Is Not Known Unless It Is Loved: How Pavel Florensky restored what Ockham stole" (fee required). Books & Culture. ^ On the 9th of January according to the Julian calendar. ^ Oleg Kolesnikov. "Pavel Florensky" (in Русский). ^ "The Pillar and Ground of the Truth: an Essay in Orthodox Theodicy in Twelve Letters". Princeton University Press. ^ Avril Pyman,Pavel Florensky: A Quiet Genius: The Tragic and Extraordinary Life of Russia’s Unknown da Vinci,Continuum International Publishing Group, 2010 p.86. ^ Antonio Maccioni, "Pavel Aleksandrovič Florenskij. Note in margine all'ultima ricezione italiana", eSamizdat, 2007, V (1-2), pp. 471-478 Antonio Maccioni. "Pavel Aleksandrovic Florenskij" (PDF) (in Italian). ^ Natalino Valentini. Pavel A. Florenskij, San Paolo editore, Milan 2010 p.lxxxii. After sentencing Florensky was transported in a special train together with another 500 prisoners to a location near St. Petersburg, where he was shot dead on the night of 8 December 1937 in a wood not far from the city. The site of his burial is unknown. Antonio Maccioni states that he was shot at the Rzhevsky Artillery Range, near Toksovo, which is located about twenty kilometers northeast of Saint Petersburg and was buried in a secret grave in Koirangakangas near Toksovo together with 30,000 others who were executed by the NKVD at the same time. In1997, a mass burial ditch was excavated in the Sandormoch forest, which may well contain his remains. His name was registered in 1982 among the list of New Martyrs and Confessors. He served at the Baikal Amur Mainline camp, until 1934 when he was moved to Solovki, where he conducted research into producing iodine and agar out of the local seaweed. 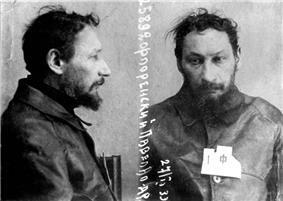 In 1937 he was transferred to Saint Petersburg (then known as Leningrad) where, on 25 November, he was sentenced by an extrajudicial NKVD troika to death. According to a legend he was sentenced for the refusal to disclose the location of the head of St. Sergii Radonezhsky that the communists wanted to destroy. The Saint's head was indeed saved and in 1946, the Troitse-Sergiyeva Lavra was opened again. The relics of St. Sergii became fashionable once more. The Saint's relics were returned to Lavra by Pavel Golubtsov, later known as archbishop Sergiy. In 1928, Florensky was exiled to Nizhny Novgorod. After the intercession of Ekaterina Peshkova (wife of Maxim Gorky), Florensky was allowed to return to Moscow. On the 26 February 1933 he was arrested again, on suspicion of engaging in a conspiracy with Pavel Gidiulianov, a professor of canon law who was a complete stranger to Florenskiy, to overthrow the state and restore with Nazi assistance a fascist monarchy. He defended himself vigorously against the imputations until he realized that by showing a willingness to admit them, though false, he would enable several acquaintances to resecure their liberty. He was sentenced to ten years in the Labor Camps by the infamous Article 58 of Joseph Stalin's criminal code (clauses ten and eleven: "agitation against the Soviet system" and "publishing agitation materials against the Soviet system"). The published agitation materials were the monograph about the theory of relativity. His manner of continuing to wear priestly garb annoyed his employers. The state offered him numerous opportunities to go into exile in Paris, but he declined them. 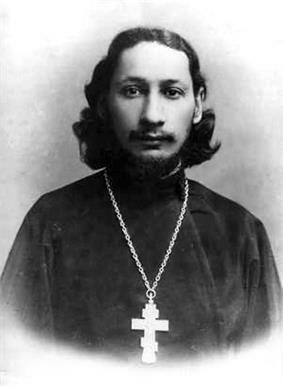 In 1924, he published a large relics of St. Sergii Radonezhsky whose destruction had been ordered by the government. He also took courses on ancient philosophy. During this period the young Florensky, who had no religious upbringing, began taking an interest in studies beyond "the limitations of physical knowledge..." In 1904 he graduated from Moscow State University and declined a teaching position at the University: instead, he proceeded to study theology at the Ecclesiastical Academy in Sergiyev Posad. During his theological studies there, he came into contact with Elder Isidore on a visit to Gethsemane Hermitage, and Isidore was to become his spiritual guide and father. 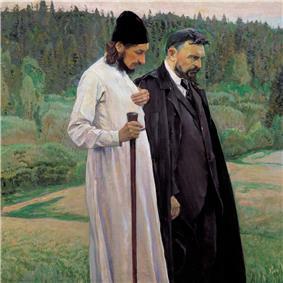 Together with fellow students Ern, Svenitsky and Brikhnichev he founded a society, the Christian Struggle Union (Союз Христиaнской Борьбы), with the revolutionary aim of rebuilding Russian society according to the principles of Vladimir Solovyov. Subsequently he was arrested for membership in this society in 1906: however, he later lost his interest in the Radical Christianity movement. He completed his high school studies (1893-1899) at the set theory.